Based in Waco, Texas, Balcones have made a name for themselves as one of the most exciting craft distillers in America with their ingenuity, passion and (of course) their whiskies. The Balcones team built most of their distilling equipment themselves, which let them design it to accommodate what they wanted to make. In their own words, they don’t just make whisky in Texas. They make Texas whisky. Texas Single Malt: A timeless style of malt whisky, Balcones “1” Texas Single Malt breathes new life into centuries of distilling tradition with classic techniques and ingredients adapted for New World tastes. Opening aromas bear hints of toffee and overripe fruits. On the palate, layers of toasted malt and honey give way to mellow notes of baked pears and apples. A long finish is accompanied by cinnamon and cloves. Texas made, Texas proud, we hope you enjoy the whisky we owe our success to as much as we enjoy making it. Rumble: Defying categorization both in its composition and its reception, Rumble is a curious twist on spirit styles from around the world. Crafted from fermented Texas wildflower honey, Mission figs and turbinado sugar, it is twice distilled in traditional copper pots then artfully matured in premium oak casks. The result is an elegant and distinctive spirit we have come to love dearly over the years. 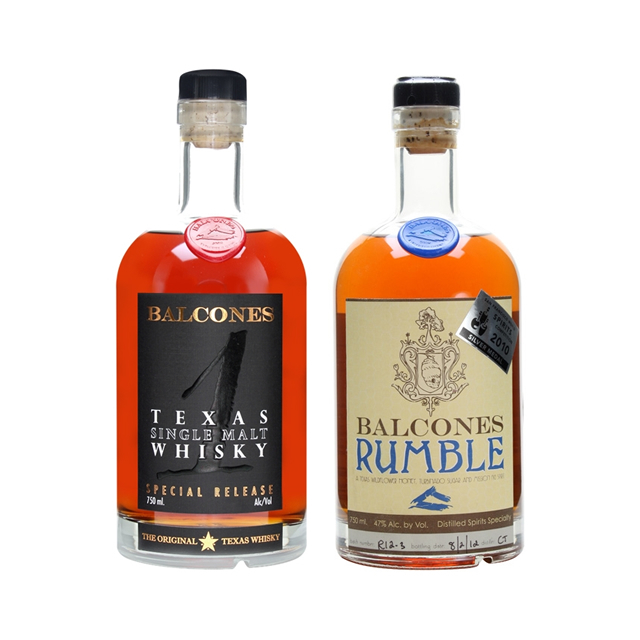 Rumble epitomizes the independent spirit of Balcones and continues to inspire us. Join us in embracing this one-of-a-kind Texas creation.